Sunday, November 4 the Echoplex held a Day of the Dead festival that featured several DJ’s, and bands. 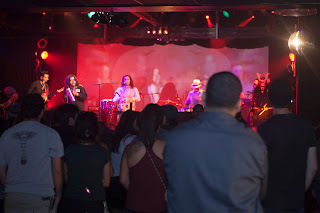 It was a Latin-American influenced night, whether it was infused into hiphop or rock, or if Salsa was mixed into American-influenced music. Different islands of artwork that featured the typical Dia de los Muertos iconography lighted up the dark venue: namely, candles and skulls. But there was no somber moment at this event that featured nothing but upbeat Latin-American music. 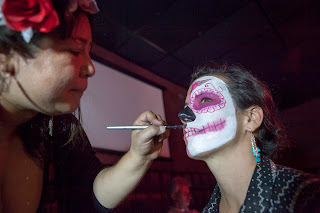 Concession stands included designer clothing; jewelry; face painting in the style of Dia de los Muertos skeletal art. 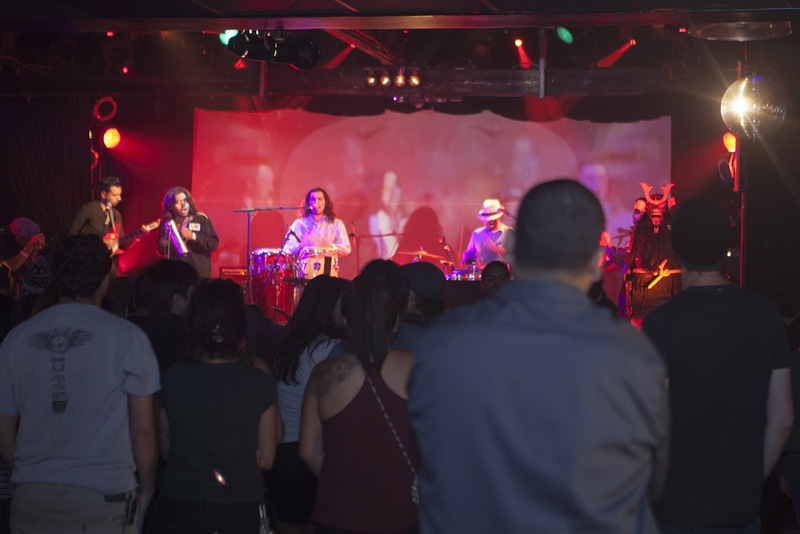 The lineup included Quita Penas, Anthony Valadez, Jungle Fire, Slowpoke, Ervin Arana, La Chamba, Olmeca, Chicano Batman, and Buyepongo. 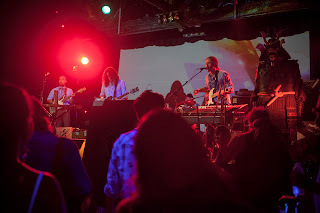 Jungle Fire plays at Day of the Dead festival, at the Echoplex, November 4, 2012. Photo by Alex Godinez. The DJs seemed to favor Cumbia, perhaps reading the crowd’s rhythmic reaction to every song. Although the crowd was predominantly Latin-American, there was a good mixture of other ethnic groups. That is always a good sign for any cultural event. I was not able to pick up all the musical genres during my listening, but this group performed as a quartet that is distinctly Angelino, for its amalgamation of different influences. The recorded track shows the love for the Motown oldies while singing in Spanish. I couldn’t help but recall the times friends in the neighborhood shared their love for Smokey Robinson, Brenton Woods, The Dells, and so many other Motown greats. 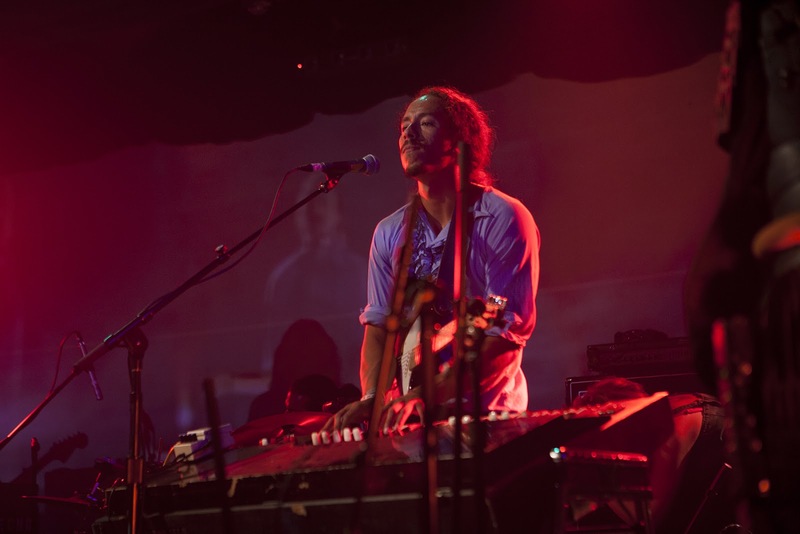 Having bands like Chicano Batman carry the torch of urban romanticism offers promise and excitement for the ever-changing L.A. music scene, as it still tips its hat to the past. 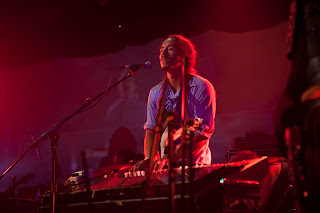 Chicano Batman frontman, Bardo Martinez performs at the Echoplex, November 4, 2012. I am impressed with the information on your blog. It is very good to add audio to the information. Have a nice week. I heard about Chicano Batman through a classmate I met in my documentary class this quarter, his name is David, but he goes by Olmeca when he performs. Small world!